‘Jibon O Rajnoitik Bastobota’, a play designed and directed by renowned theatre director and academic Syed Jamil Ahmed, has been at the centre of discussion in the art arena of Bangladesh. 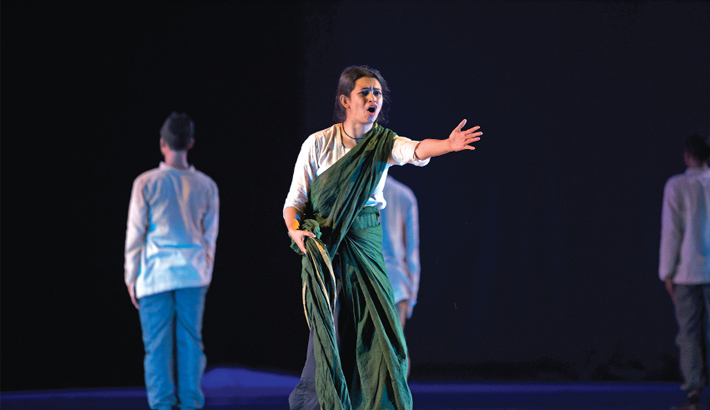 Based on Shahidul Zahir’s novel of the same title the play is the only venture of production-based theatre troupe Spardha. The play was brought on the stage in association with Bangladesh Shilpakala Academy and the Ministry of Cultural Affairs. It was premiered on March 14 at the main auditorium of National Theatre Hall, BSA. The play revolves around Abdul Majid, a victim who lost his elder sister Momena during the Liberation War. Majid gets astonished when he sees that Abul Khayer, son of Badu Mawlana (a collaborator of 1971 war), has become a political leader. Momena was kidnapped following Badu Mawlana’s direction. Four days later Momena’s dead body was found in Rayerbajar near Buriganga river. Right before the victory of Bangladesh, Badu Mawlana disappeared. When Sheikh Mujibur Rahman declared general amnesty in 1973, Badu Mawlana made a comeback. In 1985, he became a political leader and joined the all party alliance in the Anti-autocracy movement. His son Abul Khayer became a political leader as well. Badu Mawlana used to throw the chopped pieces of human body towards the crows from the roof of his house! Abdul Majid doesn’t forget all those incidents and remembering his late elder sister he keeps her daughter’s name Momena. One day when Badu Mawlana asks Majid about his daughter and comes to know her name, he questions whether Majid still remembers his sister Momena or not. Abdul Majid feels insecure and thinks about leaving the locality selling his house. With very innovative use of light, music, narration, choreography, costumes and props the performance represented the novel broadly. It also reflected magic realism of Shahidul Zahir. The production portrayed the Liberation War and its impact on the lives of the people of Shyama Prasad Chowdhury lane of Old Dhaka. Non-linear story telling focused on the brutality of Pakistan Army and their collaborators. A total of twenty performers depicted the main characters and chorus to create different space, mood and movements. Albeit the background music sometimes seemed to be louder than the actors’ voice, the performers did an excellent job. Making use of the huge space of the stage Syed Jamil Ahmed created some exceptional and meaningful images with the help of the actors’ performances and light. Music of the play set the mood and intensive acting narrated the story strongly. All the young actors, who were selected through a workshop, did a splendid job as a team. Even after the completion of the show many were seen sharing their instant reaction among each other. Consequently they wrote about the play and posted photos on social media. Besides the regular audiences a significant number of theatre workers watched different shows of the play as well. Even some of them came to enjoy the show from different parts of the country. Director Syed Jamil Ahmed, who was also the founding chairman of the Department of Theatre and Music, University of Dhaka, is famous for his other notable theatre productions which include Bishad Shindhu (1992), Kamala Ranir Sagar Dighi (1997), Ek Hazar Aur Ek Thi Rate (1998), Behular Bhasan (2004), Pahiye (2006) and Shong Bhong Chong (2009). Besides, ‘Acinpakhi Infinity: Indigenous Theatre of Bangladesh’, ‘In Praise of Niranjan: Islam, Theatre and Bangladesh’ and ‘Hajar Bachhar: Bangladesher Natak O Natyakala’ are his theatre-related publications. ‘Jibon O Rajnoitik Bastobota’ will be staged again on March 23, 24 and 25 at the main auditorium of National Theatre Hall, BSA.